This is a serious blog-ver-sa-tion and we do not encourage, motivate, or suggest readers to use the following methods. Nor do we condone any use of violence or citizens taking the law into their own hands. Clearly the organization mentioned are experienced professionals and have consulted with civic entities for services provided. The question is, "has an American city become this violent to where local, state, and federal have no immediate solution?" Detroit300 are community organizers on a whole other level of organization for justice. According to Detroit's Police Department Mapping System by March 4, 2012 - 57 homicides have been committed, 32% higher compared to March 2011. February 2012 nine month old baby, Delric W. Miller IV, was accidentally killed as a result of Detroit's violence . Detroit300 a compilation of average everyday citizens from different economic backgrounds, religions, political views and race are seeking justice for victimize citizens of Detroit. 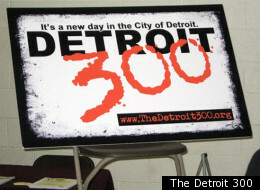 Detroit300 is asking men to become community leaders and help revive safety in their streets. Disseminating a clear message and demarcation between right and wrong, desiring justice to prevail over a crime wave of wrongful deaths. Below is their February Press Conference streamed in its entirety. Please share our blog-ver-sa-tions with your friends and stimulate your conversation with relevant talk. Follow us @whoopwoop on Twitter, Thank You!